During the past 4 years, there have been substantial new data published on the health benefits of circumcision. Observational studies suggested that male circumcision reduces heterosexual human immunodeficiency virus (HIV) acquisition in men. This finding is supported by 3 large randomized controlled trials of more than 10 000 men conducted in South Africa, Kenya, and Uganda, which found a 50% to 60% efficacy of circumcision. In the United States, there appears to be a similar reduction in risk of heterosexual HIV infection among high-risk men. Two independent randomized trials found that male circumcision decreased herpes simplex virus type 2 acquisition by 28% to 34%. Circumcision appears to reduce the risk of penile human papilloma virus infection by 32% to 35%; the evidence that male circumcision may prevent bacterial sexually transmitted infections is equivocal. These data indicate that the American Academy of Pediatrics policy on male circumcision should be reevaluated. This meta-analysis of 16 studies assessed the effectiveness of substance abuse interventions for their ability to reduce adolescent alcohol use. Brief motivational interviewing, active aftercare, multidimensional family therapy, and brief interventions with adolescents and parents had large effects on reducing adolescents' alcohol use. There were larger effects for individual interventions than for family-based interventions. Three of the 5 interventions that produced large effect sizes included brief interventions. These types of brief interventions are feasible in primary care practices. This study reports on the results of a 19-year follow-up of children born to mothers in a randomized trial of nurse home visiting and focuses on their graduation from high school, employment, sexual behavior, childbearing, substance use, and crime. Girls visited by nurses during pregnancy and infancy were less likely to have ever been arrested or convicted than were youth in the comparison group; there was no significant effect on crime in males. Females in the nurse-visited group born to high-risk (unmarried and low-income) mothers had fewer children and were less likely to have received Medicaid than high-risk females in the comparison group. There were no overall treatment effects on high school graduation, economic productivity, number of sexual partners, use of alcohol or illegal drugs, use of birth control, teen pregnancy or childbearing, or use of welfare, food stamps, or Medicaid. Given that other long-term follow-up studies of model early childhood interventions for infants and preschoolers have reported continued treatment effects with older adolescents and young adults, the impact of well designed and implemented early interventions on crime reduction is promising. Cox proportional hazard curves showing the hazard of first arrest for girls in the comparison (n = 73) and nurse-visited (n = 43) groups. Over the last decade, the number of parents who claimed nonmedical exemptions to school immunization requirements has more than doubled. The vaccine against varicella zoster virus is the most commonly refused childhood vaccine; both parents and providers view varicella illness as the least severe vaccine-preventable disease. 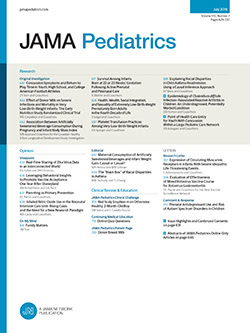 In this case-control study of children with varicella infection, vaccine refusal was strongly associated with medical record–verified varicella illness (odds ratio, 8.6; 95% confidence interval, 2.2-33.3). All 7 of the unvaccinated varicella cases were attributed to vaccine refusal. The total population-attributable risk was 4.7% (95% confidence interval, 0.7%-8.5%), suggesting that 4.7% of the varicella cases in the total population were associated with vaccine refusal. These results provide evidence to counter the misperception among some parents that unvaccinated children are not at risk for vaccine-preventable diseases. As vaccine refusal increases in the United States, health care providers are in a uniquely trusted position to influence immunization behavior.